There's a Magmain stuck in the wall, but it only ends up like this when you restart from the nearby checkpoint. The level's "Atroxian base"
Me and omer made a rainbow dash HUD for doom, for our mistake most of the doomers are anti-bronies. It makes me think of Keen Dreams (lollipops in the trees), Word Rescue (some of the water effects, I think), and Jazz Jackrabbit (doesn't that game have bees or hornets?) at times. I like the variety of atmospheres. The crystal shard one is thus far my favorite, with the trees a close second. Cargo Transit A was an interesting level. It took a while to get the hang of the conveyors. The port was a cool level; it seemed a bit like Sand Yego, and I don't know why. The rolling electrical enemies seemed kind of cute. I appreciated the signs pointing me the right way. I like the glass tubes and checkpoints. There was a lot of backtracking in some levels, and I got lost easily. I had to cheat to finish the Security area and the Base. The identical switch markers next to each other in the former had me so confused, as well as multiple occurrences of each gem. The latter was so convoluted that I missed the switch that would allow access to the green gem, and I could not find a way to it. Was I supposed to fall in a certain direction after getting the yellow gem? It was sometimes hard to figure out if a small led to a secret passage or was a continuation of the main route. I also got turned around on the world map. It took me a while to figure out what to do after I got the second yellow gem in the mine. My frustration on that was more with myself than the designers. If there were any Keeners afraid of spiders, this was not the mod for them. The Splider was a tricky critter. Hi, so I've just started my YouTube playthrough of this mod. I must say it's really good so far. Right now I'm on Crystalcomb Hive. The only problem is, I seem to have trouble figuring out how to get the green gem on that level. I looked up the map and I can't seem to find the doorway that leads to the room with the green gem. Is there some hidden doorway in that level that leads to the green gem? Or is there some door that I need to take twice? oh yes, I remember this passage. it is indeed a bit tricky and it took me a whole lot of time to figure it out myself. what you need to do is to look for a secret passage on the top left of the level... good luck. Hello Lingyan203, thanks for doing a playthrough! I haven't had time to watch all of it, but I always enjoy seeing people play through things. 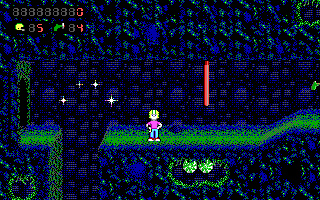 That particular green gem in Crystalcomb Hive is especially tricky, perhaps overly so. In fact, the door may have nothing to do with getting it at all. Anyway, I'm looking forward to seeing more your progress. Also, I think it's really cool that you've done playthroughs of many other older games, many of which I enjoyed as a kid. The ClueFinders series is a personal favorite of mine, and it's neat to see that you've covered those games. Cluefinders... Wow, that activated a long-dormant part of the old positronic matrix. Gridlock wrote: Hello Lingyan203, thanks for doing a playthrough! I haven't had time to watch all of it, but I always enjoy seeing people play through things. That particular green gem in Crystalcomb Hive is especially tricky, perhaps overly so. In fact, the door may have nothing to do with getting it at all. Anyway, I'm looking forward to seeing more your progress. Hi Gridlock! No problem, anytime! I've just finished the first 16 levels. So far this mod is pretty good. I wonder if there's a way to get to the level Crystal Sanctuary? Also thanks so much! I'm glad you enjoyed my playthroughs! btw, are you planning on making another mod or finishing some of the early mods that you've made in the past but abandoned? I wonder if there's a way to get to the level Crystal Sanctuary? I'm glad you asked. I'll give you a pretty good hint. Look for the red roots in Hornet Hive and see if you can find a way to reach them. It would be really cool if you could cover Crystal Sanctuary (the secret level). If you need to get back into the level, F10-W to level 10. Gridlock wrote: Look for the red roots in Hornet Hive and see if you can find a way to reach them. So, i finnaly completed this mod on hard and i must say; wow. I still think this qualifies as (one of) the best mods in almost every aspect. also excellent level design, I like how you killed a lot of backtracking that most galaxy mods require. The in-game checkspots also stopped me from saving every 20 seconds. 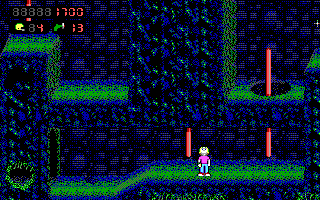 these background graphics are some colour variations of those unused Keen-4-Demo tiles, aren't they?! You noticed? They certainly are. I too have used them. I finally completed the game. The boss fight and the ending sequence was mind blowing! I really did not expected such thing. This truly sets the bar to a new heights. I was like "am I even playing a Keen mod now?" I gotta say the boss battle and the ending was the most impressive thing of that mod to me. A lot of effort was put onto this and kudos to everyone who was involved into this. The story keeps me wondering what is that protocol X or whatever it was called. Also, there was a hint that maybe it's Mortimer behind all of this. At least I think it's him, even though he was never mentioned. He might be working in a collaboration with VitaCorp? On a side note, I always thought Atroxus should be named Atroxious. I finally completed the game. The boss fight and the ending sequence was mind blowing! Thanks! I'm glad to hear you enjoyed it! Indeed, there are some answered questions in the plot. I hope that I'll be able to address them eventually (The Alphamatic will at least further the story even if it only raises more questions). I haven't figured everything out yet, but I certainly have an idea of where I want things to go. Mortimer might be involved, but maybe not how you'd expect. We'll see. I wish I had more time for modding, but I'm completely busy with college, job hunting, and tons of production projects. I still have an idea for AR sequel or two after the Alphamatic in the back of my head, so maybe someday.